It�s fast. Really fast. Firefox Quantum is over twice as fast as Firefox from 6 months ago, built on a completely overhauled core engine with brand new technology stolen from our advanced research group, and graced with a beautiful new look designed to get out of the way and let you do what you do best: surf a ton of pages, open a zillion tabs, all guilt free because Firefox Quantum uses less memory than the competition. Your computer will thank you. Jakarta, 7 November 2017 - Mozilla, a pioneer and advocate for the Open Web, is pleased to introduce Firefox Quantum, the whole new browser which uses Mozilla's next-generation Web engine, and Firefox Rocket, a fast and lightweight Android browser tailor-made for Indonesia. Get ready to experience these two modernized and customized Firefox browsers and take the quantum leap with us. Faster. Lighter. Ready for takeoff! Hello Indonesia. We think it should always be fun to get on the web. Fast. Breezy. Easy. Especially on your phone. That�s why we built Firefox Rocket. We looked at all the issues you face on mobile. And we said to ourselves: we can fix alllll of this. A less than 3MB file size plus automatic Turbo Mode means blazing fast browsing. Say goodbye to those annoying ads chasing you all over the web. In two taps, the whole screen is saved for reading offline. Save space on your phone by sending your cache and downloads straight to an SD card. Ready to blast off with a fresh Android browser? Give Rocket a try. Membangun sebuah startup tidaklah mudah. Ada banyak langkah yang harus dilalui. Kadang, kamu dihujani dengan banyak pertanyaan dan keraguan perihal keputusan yang harus diambil, tindakan yang harus dilakukan atau kapan memulainya. Mozilla akan mengadakan survei kembali. Oleh karena itu, kami membutuhkan bantuan anda untuk mendaftarkan diri pada pemilihan kandidat yang bisa membantu kami dalam survei. Untuk 8 orang terpilih akan mendapatkan hadiah Voucher MAP Rp 600.000 dan T-Shirt Mozilla! You guys, we�ve been busy over here at Mozilla. We figured that mobile browsing wasn�t doing it for you. So we tackled the trickiest issues you face on your phones, from the need for more speed to smarter solutions for saving space and data costs. We think you�ll be impressed by how fast and lightweight our new browser is. We�re eager to see if you agree. Will you do us a favor and give the beta for Firefox Rocket a shot? We�ll use your feedback to make it even better. Help us test our new app! We just made a brand new mobile browser. It�s a lightweight, lightning fast browser made specifically for Indonesia. We love to have you try it and tell us what you think. With your feedback, we will make it even better. The incredibly small file size means it takes up almost no space on your phone. And Turbo Mode means lightning fast browsing and downloading. Save on data costs with Turbo mode, which blocks unwanted ads and trackers. Wanna save even more? Enable image blocking while you browse. Say goodbye to those ads chasing you around the web. Which means more screen space for the stuff you care about. In two taps, you can save the whole screen to read offline. And a website link is automatically saved too, so you can browse back there whenever you want. With single tab navigation, the search bar at center stage, and the menu at the bottom of the screen, everything you want to do is right at your fingertips even with one hand. Tahukah kamu, dengan jumlah penduduk lebih dari 260 juta orang, Indonesia menjadi magnet bagi banyak mata terutama investor dan pengusaha. Pasar digital yang diproyeksikan bernilai US$ 130 miliar pada tahun 2020 ini membuat sektor bisnis e-commerce naik daun. Namun sebenarnya, potensi bisnis startup dan teknologi di tanah air tidak hanya terpaut pada sektor e-commerce saja namun juga empat sektor bisnis lain. Mereka adalah fintech, layanan on-demand, cloud computing, dan software-as-a-service (SaaS). Lalu, bagaimana sebenarnya perkembangan industri startup pada keempat vertikal tersebut? Dapatkan lebih banyak insight menarik dan temui pakar di balik industri startup dan teknologi di gelaran tahunan Tech in Asia Jakarta 2017 pada 1-2 November 2017 mendatang! Sebagai official community partner, kami Mozilla Indonesia mengajak kamu untuk bergabung bersama di barikade paling depan Tech in Asia Jakarta 2017. Registrasi sekarang juga dan dapatkan diskon tambahan 5% dari promo yang sedang berjalan. Gunakan kode �mozillaid� (tanpa tanda petik) saat registrasi pemesanan tiket. Tunggu apa lagi? Yuk segera reservasi kursimu melalui tautan berikut ini. P.S Kamu juga bisa mengusung startup milikmu di Bootstrap Alley (Startup Exhibition) #tiajkt2017, di sini! Hai. Kami Mozilla. Bulan ini, Juli, kami akan menyelenggarakan beberapa sesi ujicoba untuk mendalami kebiasaan berinternet khalayak Indonesia. Sesi ini akan bertempat di Ruang Kounitas Mozilla (Mozilla Community Space) Jakarta, dan berlangsung selama 60�90 menit. Sebagai tanda terima kasih keikut sertaan kamu, kami menyediakan imbalan voucher belanja dan t-shirt Mozilla. Kamu bisa pilih tanggal dan waktu yang sesuai untuk kamu. Berikut adalah mereka yang terpilih untuk mengikuti Mobile User Testing (Android) yang akan berjumpa langsung dengan Mozilla Staff. Selamat! Last year, we introduced Firefox Focus, a new browser for the iPhone and iPad, designed to be fast, simple and always private. A lot has happened since November; and more than ever before, we�re seeing consumers play an active role in trying to protect their personal data and save valuable megabytes on their data plans. While we knew that Focus provided a useful service for those times when you want to keep your web browsing to yourself, we were floored by your response �� it�s the highest rated browser from a trusted brand for the iPhone and iPad, earning a 4.6 average rating on the App Store. Today, I�m thrilled to announce that we�re launching our Firefox Focus mobile app for Android. Like the iPhone and iPad version, the Android app is free of tabs and other visual clutter, and erasing your sessions is as easy as a simple tap. �Firefox Focus allows you to browse the web without being followed by tracking ads which are notoriously known for slowing down your mobile experience. 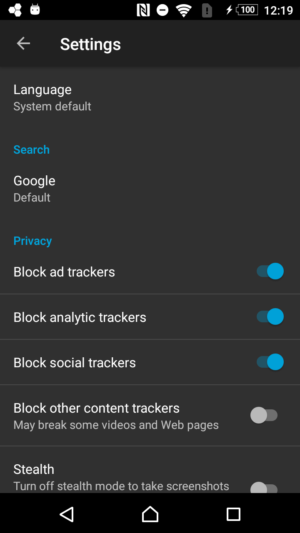 �Why do we block these ad trackers? Because they not only track your behavior without your knowledge, they also slow down the web on your mobile device. Ad tracker counter � For the curious, there�s a counter to list the number of ads that are blocked per site while using the app. Disable tracker blocker � For sites that are not loading correctly, you can disable the tracker blocker to quickly take care of it and get back to where you�ve left off. Notification reminder � When Focus is running in the background, we�ll remind you through a notification and you can easily tap to erase your browsing history. For Android users we also made Focus a great default browser experience. Since we support both custom tabs and the ability to disable the ad blocking as needed, it works great with apps like Facebook when you just want to read an article without being tracked. We built Focus to empower you on the mobile web, and we will continue to introduce new features that make our products even better. Thanks for using Firefox Focus for a faster and more private mobile browsing experience. On the Firefox team, one thing we always hear from our users is that they rely on the web for complex tasks like trip planning and shopping comparisons. That often means having many tabs open. And the sites and web apps running in those tabs often have lots of things going on� animations, videos, big pictures and more. Complex sites are more and more common. The average website today is nearly 2.5 megabytes � the same size as the original version of the game Doom, according to Wired. 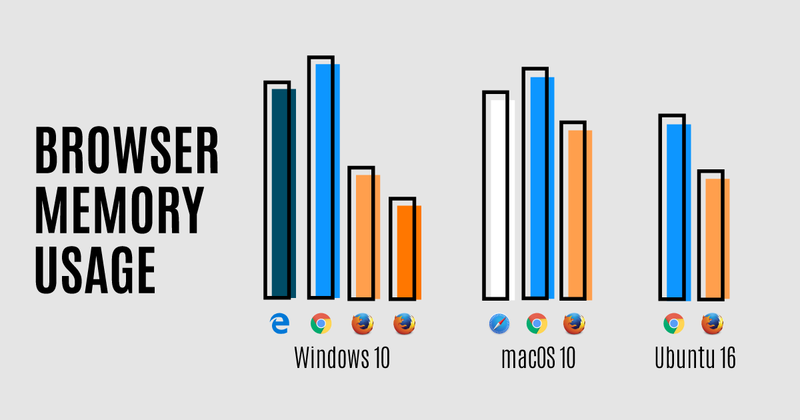 Up until now, a complex site in one Firefox tab could slow down all the others. That often meant a less than perfect browsing experience.